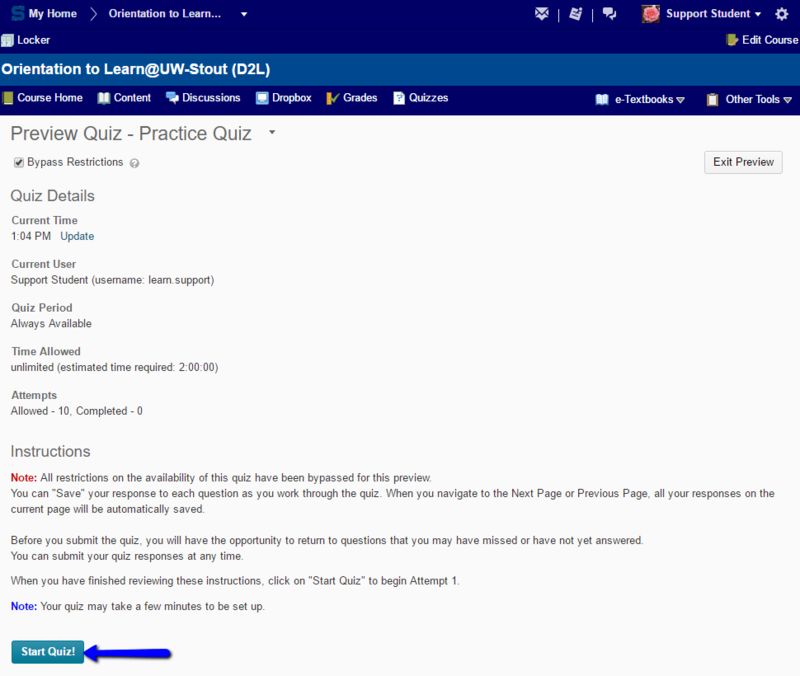 The quiz tool in Learn@UW-Stout allows users to take quizzes assigned by their instructors in an online atmosphere. 1. On the "Quiz List" page, click on the quiz you want to take. 2. Read the instructions and details for the quiz, and when you're ready click "Start Quiz!". 3. Answer each question. You can see which questions you have saved answers to in the "Questions" section of the quiz's left panel. You can also click the question number in the quiz's left panel to go back to the question. ***NOTE: We recommend you click the corresponding Save button after answering a question. You can also click Save All Responses if you are not finished answering all questions on a single page, or if you are working on a time-consuming question and need to save all previous responses. 4. Click "Next Page" or "Previous Page" to navigate between pages. 5. Click "Go to Submit Quiz" when you are finished with the quiz. ***NOTE: If you try to submit a quiz with unanswered questions, you will see a warning at the top of the Submit Quiz page informing you about unanswered questions. Click each link beneath the warning to return to each unanswered question. After you attempt to answer all quiz questions click "Submit Quiz". If your quiz has a time-limit you may be prompted or forced to submit your quiz. If the quiz is set to auto-submit, at the end of the designated time period only saved questions are submitted. ***NOTE: Although you can start a quiz and navigate away from it at any time during the attempt, the timer for the quiz does not pause and continues to record your Time Taken.